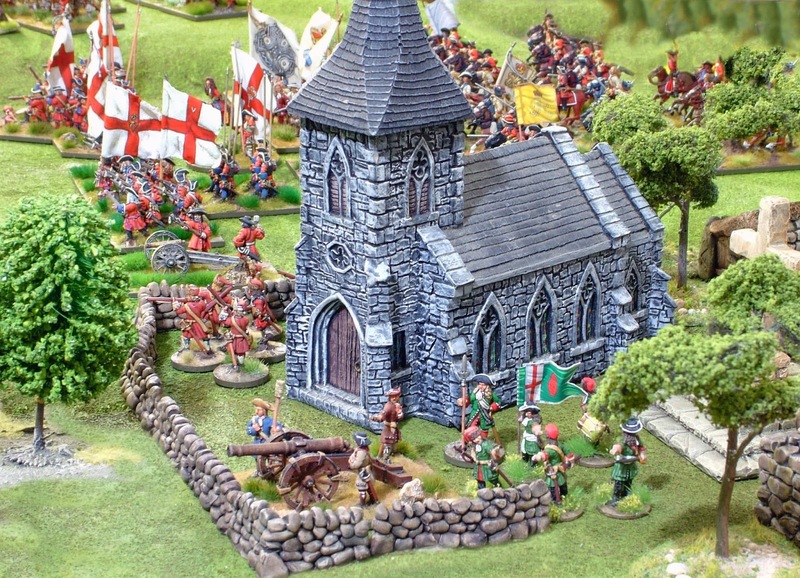 Amongst my gaming circle there has been a gratifying and high quality effort to ensure our games are fought with as many Warfare Miniatures as possible. Most of us have worked on the 'I'll do that unit because I like it' principle so we did not have all of the regiments present at Aughrim within our collections. This meant a reasonably high degree of substitution. A good example was the inclusion of General High Mackay's Scots Dutch Brigade from my own collection. Although the bold Sir Hugh played an enormously prominent role in the engagement, his brigade, cut to pieces at Killiecrankie in 1689, was not at Aughrim. In our version they were! General Mackay's Brigade... interlopers at our Aughrim refight! Similarly we included a battalion of the French Regiment Zurlauben because it looked nice! 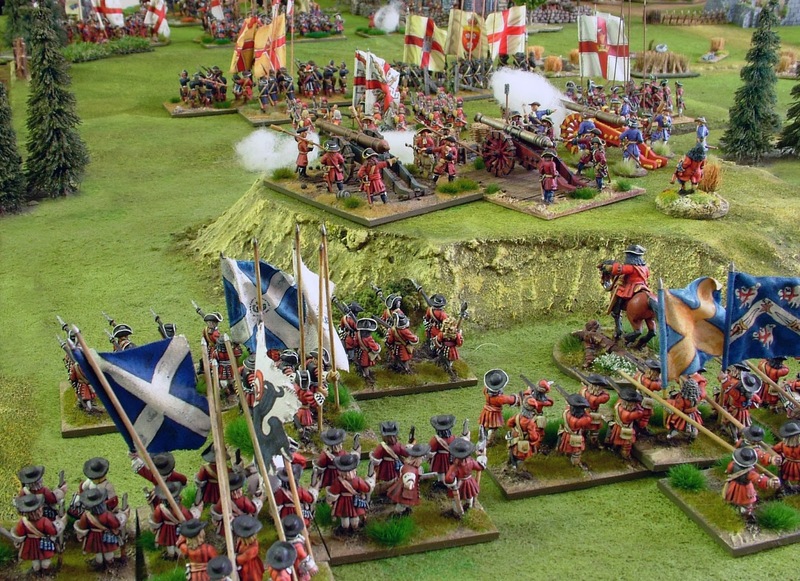 Interestingly, there is absolutely no surviving information on many of the Jacobite regiments present at the battle. Their clothing and flags are pure conjecture. this means we felt largely immune to the button counting brigade's post match autopsy of our efforts! A good book to have at hand if you are reading this blog series is Mike McNally's;The Battle of Aughrim 1691. Mike describes the positions of many regiments and our version largely follows this with a couple of notable exceptions. 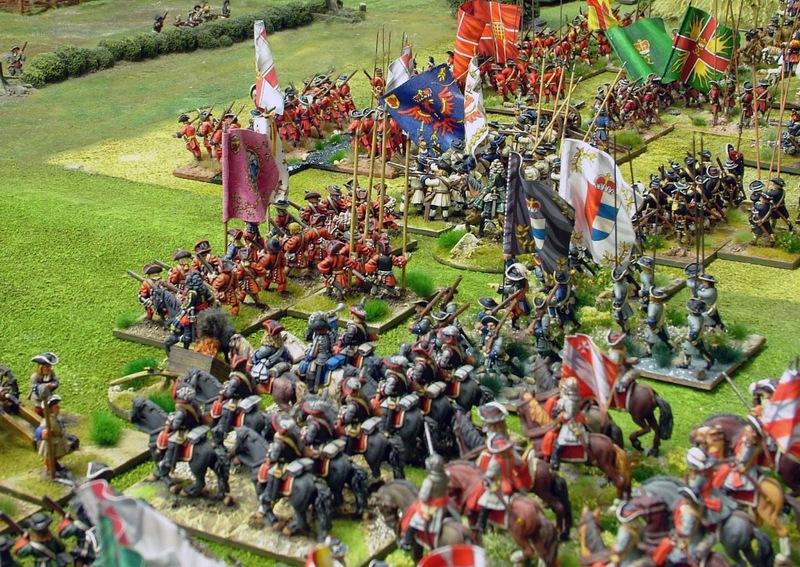 The positioning of several Jacobite cavalry regiments such as Abercorn's and Lutterell's seem to be exactly opposite. There was a very simple reason; Dave and I both wanted to command units that we had painted so some units swapped places! We did managed to pretty accurately represent the actual number of battalions and squadrons at the battle if not their actual names. As Beneath the Lily Banners was he chosen rule set it is important to remind readers that with a model to man ratio of about 1:35 a six model squadron of Horse actually represents 210 men or between 2 and 3 real squadrons. This means our 28 Williamite squadrons were equivalent to between 56 and 84 real squadrons. Using many of the little amendments which I have developed since the release of BLB1 in 2008 we had specific rules to handle the different ratios of pike and shot in some of the Irish units, the use of commanded shot detachments and the grading of a couple of Protestant Irish Horse units to 'Blade' as opposed to the standard 'Bullet' classification. Troops from the collections of Bob Talbot, Gerry Donohoe, Dave O'Brien, Paul McLauchlin and myself adorned the table. 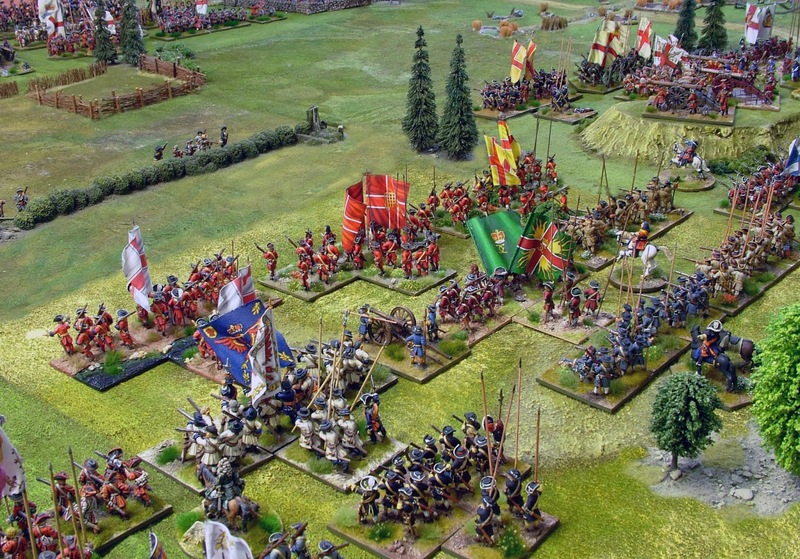 Within the ranks were regiments painted by Andy Thompson, Chris Meacham and Peter McCarroll. Overall a really nice line up.